The Newman Guild is a women's group supporting the mission of the USC Catholic Center and Our Savior Parish: to create a vibrant campus ministry for all students, providing programs and opportunities for spiritual, social, and intellectual growth. Membership is open to women of all faiths. To register, please complete the information below. Are you open to something different this Lenten season? 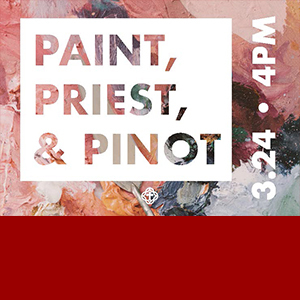 We invite you to a special Newman Guild spring event, Paint, Priest, & Pinot, on Sunday, March 24 at 4:00 p.m. in the USC Caruso Catholic Center, Newman Hall. Please visit our event page to learn more and register today! For more information about the Newman Guild, please contact Rose Ramirez.